The happypad (EU Design 003013150-0002) is the perfect combination of the snifflawn and sniffpad. It combines the countless hiding places of both products which offer plenty of searching fun in a limited space. The motivation and genius design behind all our innovative high quality cognitive products here at KNAUDER´S BEST reflect the passion and philosophy of our company. As you play together with your faithful companion, you develop his intelligence and trust; he becomes more even-tempered, and the bond between you is strengthened. Just 7-10 minutes of activity are enough to boost your pooch’s cognitive skills, challenging him and strengthening your companionship through play. The numerous pockets and lovingly incorporated hiding places provide endless opportunities for hiding treats for your four-legged friend, and guarantee hours of distraction. Our hand-worked textile products, lovingly crafted in the EU, also offer handicapped, injured and anxious dogs the chance to experience a huge sense of achievement within their own comfort zone. 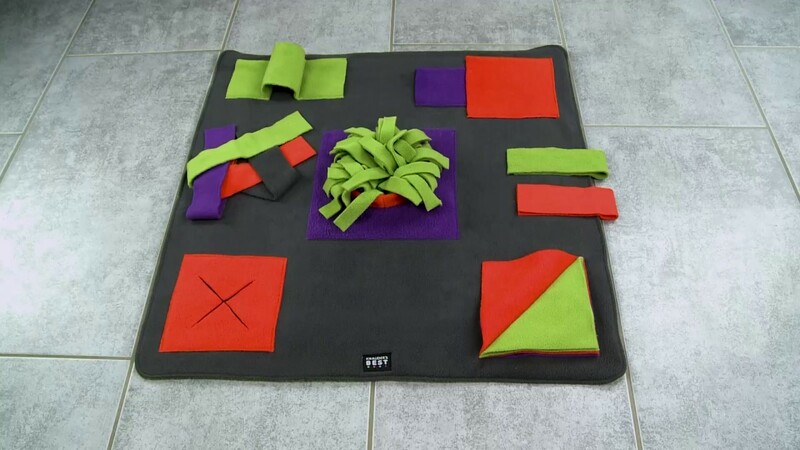 All of our product innovations here at KNAUDER´S BEST are carefully designed high-quality toys tailored to the needs of your pet, and are explicitly recommended by dog trainers. The love of dogs, innovation, and a whole lot of good ideas are the trademark of the “original” KNAUDER’S BEST products. Professional know-how is the basis of our cognitive dog toys, which are designed in our very own design shop and rigorously put through their paces – with Swabian thoroughness – by our own dogs. The products that pass the test are produced by hand, with great attention to detail, in our sewing rooms, using high-quality materials. The joy of searching for things, and the natural challenge it represents for our furry friends, are the secret behind our Schnüffelrasen, Sniffpad etc. Dogs who face regular mental challenges are relaxed dogs. In the mutual searching games, we strengthen our relationship with our dog, learn to understand him better, encourage our mutual trust and tighten the bond between us. In order to improve your dog’s condition and concentration, our animal tools are the ideal accompaniment to canine sport. The exciting searching activities give you the opportunity to gain the trust of nervous dogs and dogs from animal welfare, and to encourage their self-confidence. For older, injured or handicapped dogs, the manageable radius of activity is just right, so that they can celebrate great successes within a short space of time. With the Schnüffelrasen, Sniffpad etc., we guarantee an exciting sniffling experience for your four-legged friends, that will never get boring.